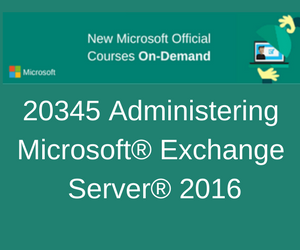 This 5 day course teaches IT professionals how to administer and support Exchange Server 2016. Students will learn how to install Exchange Server 2016, and how to configure and manage an Exchange Server environment. The course covers how to manage mail recipients and public folders, including how to perform bulk operations using Exchange Management Shell.